As the final visit of his trip to Japan, Charl spent a very enjoyable day at the Nara Institute of Science and Technology, just outside Nara. He was hosted by Prof Kawai and colleagues from the Laboratory for Photonic Molecular Science. Charl had a number of very interesting discussions about their exciting science, and potential future interactions before and after his talk in the afternoon. 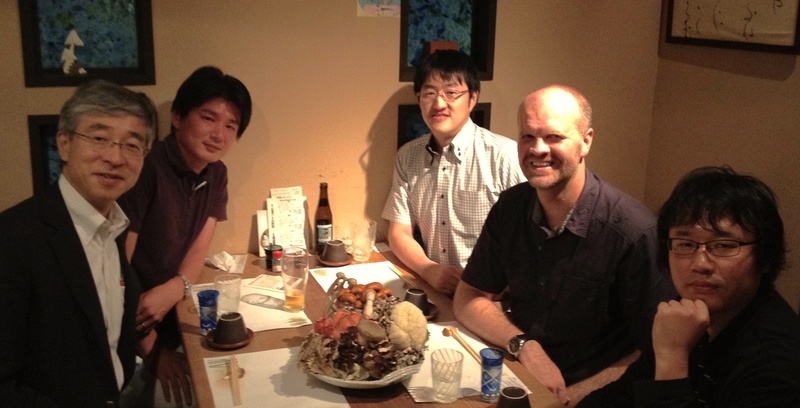 Prof Kawai and colleagues (professors Nakashima, Nonoguchi and Yuasa) treated Charl to an exquisite meal at a restaurant that specialises in Japanese mushroom delicacies! This entry was posted in Collaborations, General interest, Presentation and tagged Kawai, Nara, Nara Institute of Science and Technology by Faul Research Group. Bookmark the permalink.